Fans rush to the floor after a Bulldog win! 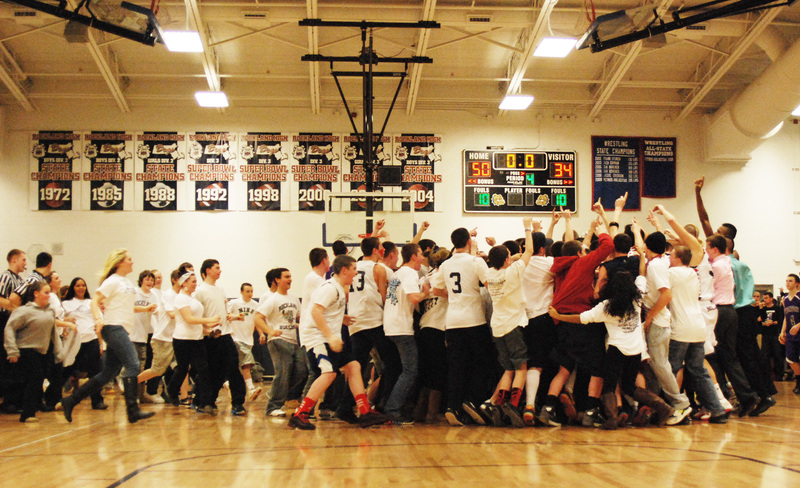 This has been quite an exciting year for the winter sports of the Rockland Bulldogs. Several of the Bulldog teams have made it to Postseason Tournament. The boys and girls basketball teams as well as the hockey team will be starting their first round in MIAA Division 3 South this week. Tomorrow, March 1, the girls basketball team will be playing their first tournament game at home. The team will be facing Old Rochester at 6:30. On Thursday, March 2, the boys basketball team will be going to Bourne. They will be facing Bourne at 6:30. The hockey team will also be making the journey to Bourne to kick off their first postseason game at 8.They will be playing Cardinal Spellman at Gallo. Shakespeare wrote, “All the world’s a stage, and all the men and women merely players,” and this has never been more true for Rockland High School’s drama troupe as it tirelessly prepares for what some may call the Super Bowl for theatre geeks. Not only do the participants get to perform and witness a day filled with the performing arts, but they also make friendships that last a lifetime, learn incredible new things about their craft, and create memories they’ll never forget. 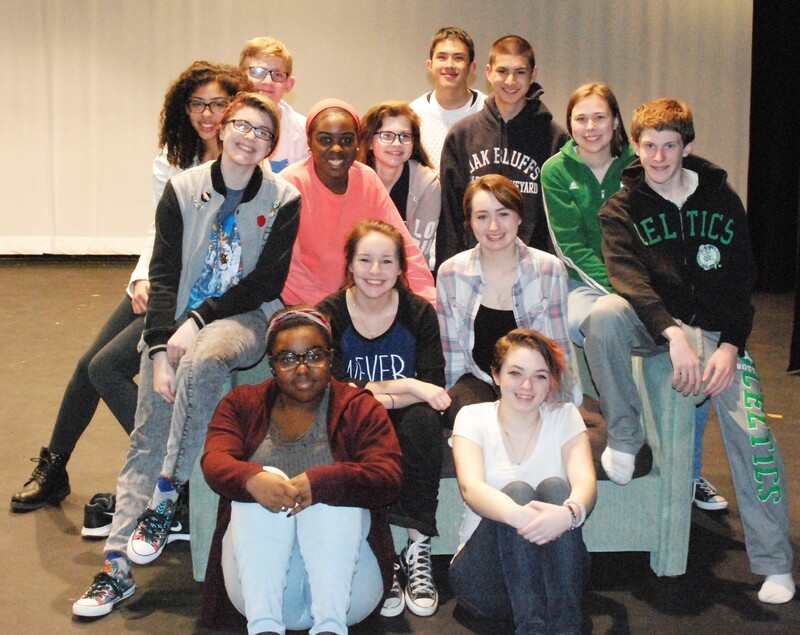 For the past three years, the drama troupe has come heartbreakingly close to moving to the next leg of competition. Held back by a lack of budget to pay for sets, the group last year came closer than Rockland ever has. The talent has been undeniable. This time, the cast and crew of “Room 404” are feeling confident as the big day draws closer. “The show is coming along fantastic! We still have a lot of work to be done such as memorizing lines and working with sets,” said Belmonte last week. This year’s show is student written, student directed and put together completely by students. “Room 404” is a murder mystery that takes place in the 1950s. It is the story of a beautiful Hollywood star killed in her hotel room, and of the secrets that are revealed about her and everyone around her afterwards. It deals with a number of mature topics, and a large amount of red dyed corn syrup. The cast and crew have put in a great deal of time and effort to make this happen. Be sure to mark Saturday, March 4 on your calendar and support the RHS Theatre Guild when they head off to Norwood High School for the preliminary round of the competition. Follow this link for the METG schedule for host schools across the state. Four teams win SSL titles this winter! 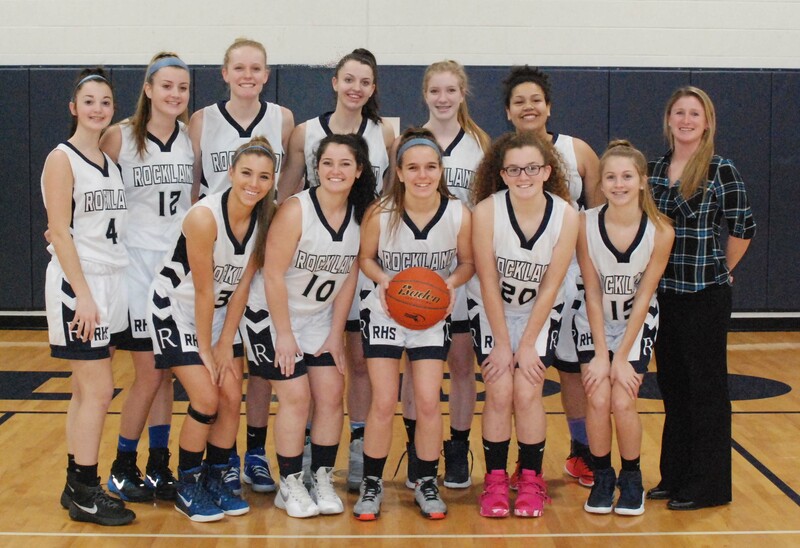 Four Rockland High School winter teams have captured their sports’ South Shore League titles this season. The hockey team has had an outstanding winter season 2016-2017 and are South Shore League Champions. The hockey team was the first to land on top with a win against Hull/Middleboro on Jan. 29. The hockey team’s record is 17-1-2 in what many have called the best season ever for the squad. It’s their first league title since 1991. Check out Liam Lenihan’s story on the hockey team’s season here. The Rockland-Abington Wrestling team. They are champs for two years in a row. Next was the wrestling team with their win over Randolph on Feb. 1. The combined Rockland-Abington squad has now completed back-to-back title wins, having captured the crown last year as well. Read John MacDonald’s article about their season here. The girls basketball team has captured the SSL Sullivan Division title again this year. With a record of 13-5 and 11-2 in the league the girls basketball team has captured the Sullivan Division Championship. They had lost to Norwell on Feb. 3 which meant that the two teams could have tied for the title but Norwell lost to East Bridgewater last Friday night, giving Rockland the championship alone. With two freshmen in the starting line-up the team was perhaps not not expected to do as well as they have. Here is Jayden Libby’s story on the girls’ season. The 2016-2017 boys basketball team have won their second league title in a row. 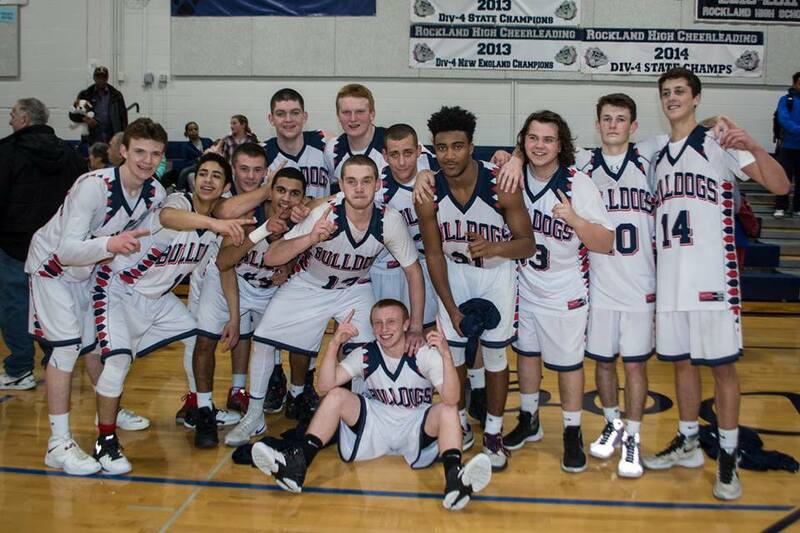 The boys basketball team is the final team to win the SSL Sullivan Division championship. They did that on Feb. 15 with a great win against Norwell, 62-57. It went down to the wire but the Dogs prevailed. Here is Jake Lauria’s story on the boys’ season. And although the swim team did not win a title, they worked hard this year. Here is Josh Thompson’s story about the swim team. Four teams, four titles! It’s been a great winter season 2016-2017, and as always, it’s a great day to be a Dog! The schedule for upcoming games is on the right column of this website. Bulldog Nation will hopefully support all the teams in their last regular season games so that they can get good seedings for the postseason play-offs. Back, left to right: Doug Reardon, Emily Delaney, Jeffre Donahue, Jasmin Morse, Elizabeth Kelley, Leo Field. Front, left to right: Corey MacDonald, Harry Hunter, Abigail Condon, Caitlin Cameron, Jad Bendarkawi. For months now the Rockland High School Mock Trial teams have been preparing their arguments, studying their affidavits, and running numerous rehearsals of the case in preparation for their meets in January and February. The team is coached by history teachers Randall Grimmett and Gregory Rowe. The prosecution team included attorneys seniors Emily Delaney, Leo Field, Doug Reardon, junior Harry Hunter, and sophomores Elizabeth Kelley and Jasmin Morse. The prosecution witnesses included sophomores Abby Condon, Caitlin Cameron, and senior Jeffre Donahue. The prosecution had two meets in the season. The first was against Whitman Hanson where Rockland was able to pull off their first win of the season on January 25. Their next meet was on January 31 against Thayer where they put in quite the fight, but in the end lost. On the other side, the defense team went against Braintree on February 8. The defense included sophomore John Ellard as the defendant. Attorneys included seniors Emily Delaney, Doug Reardon, and Leo Field, junior Harry Hunter, and sophomore, Jasmin Morse. Witnesses were senior Corey MacDonald, and freshman Jad Bendarkawi. In the end, the defendant was found guilty, although Rockland won in points scoring. Overall, RHS Mock Trial had a successful season after putting in much hard work and effort. This year, Mock Trial will be losing seniors Emily Delaney, Leo Field, Corey MacDonald, Harry Hunter, Jeffre Donahue, and Doug Donahue who will all be leaving the team on a high note. 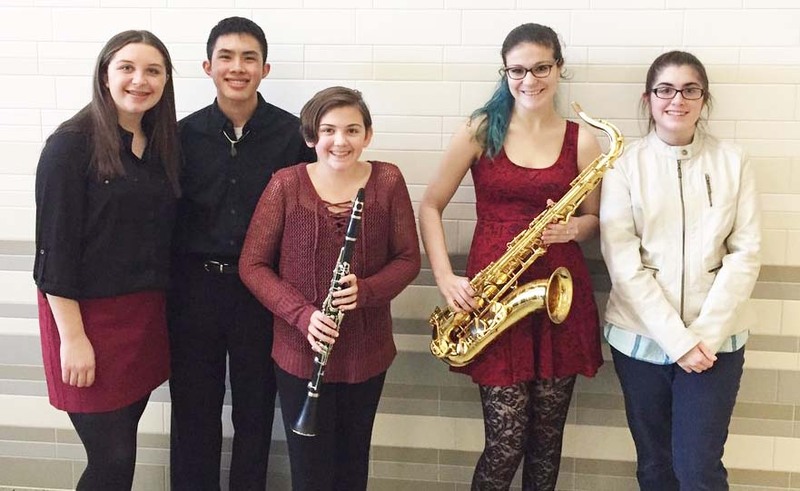 Five music students from Rockland High School and the Rogers Middle School recently auditioned for the SEMSBA Music Festival. From left: Olivia Janis, Sean Vo, Olivia Jones, Lauren Zaremba and Erin Field. photo courtesy of Lindsay Crook. This past Saturday, February 4, auditions were held for the SOUTHEASTERN MASSACHUSETTS SCHOOL BANDMASTERS ASSOCIATION’s (SEMSBA) Music Festival, an annual music festival that includes a concert band and a chorus. It’s divided into Junior SEMSBA and Senior SEMSBA . Senior SEMSBA is strictly limited to high school music students, whereas Junior SEMSBA is normally limited to middle school music students. Freshmen in high school have the option of auditioning for either. Sign-ups are just permission slips that have to be brought home to be filled out by the student and parent and brought back with a fee to a music teacher. On Saturday, seniors Sean Vo and Lauren Zaremba auditioned for Senior SEMSBA chorus as a tenor and Senior SEMSBA band on tenor saxophone respectively. Junior Erin Field and freshman Olivia Janis auditioned for Senior SEMSBA chorus as sopranos. Seventh grader Olivia Jones auditioned for Junior SEMSBA band on clarinet. The results were released on Sunday, February 5. Vo and Field made it for the choir and Zaremba made it for the concert band. Janis and Jones did well in the auditions and gained experience for next year. The three upperclassmen will head to Durfee High School on March 24 and March 25 to participate in the Senior SEMSBA festival. Registering the teams from all across Massachusetts that participated in the bocce tournament on Jan. 29. Things are looking good in this round of bocce. Adam Royle, Jurnee Dunn and Nick Cara. The court is ready for the Bocce Tournament. The unified bocce tournament took place on Sunday the 29th at Rockland High School. This tournament was played by “kids from all across Massachusetts, as well as their special education programs,” said Noelle Atkins, president of Rockland’s Student Government Council. Sixteen Massachusetts high schools took part in the tournament. Not only was it a good chance for Rockland High students to get community service hours but it was a chance to participate in something truly amazing. “The unified bocce tournament is a Special Olympics event where kids from all across Massachusetts come together to play bocce with their special education program.” says Atkins. Many of Rockland’s Pathway students participated.